If you are short of time, the answers to the following 3 questions should let you know all you need to about the FlexCare. If I have missed something, let me know in the comments. If you want more detail, you can read our full Sonicare FlexCare review further down the page. The short answer is a definite no. A package containing 2 brush handles, chargers and travel cases there is a lot on offer here. In fact for couples or families this represents as really good value option given what is included. If I was to be a bit picky, the design feels a tiny bit dated given some of the other options. If you need multiple handles then this is a good choice, but for the majority who only need or want a single electric toothbrush, there are some alternative options worth consideration. Our recommendation is the Sonicare ProtectiveClean 4100. It keeps many of the positives, but it is a newer brush that focuses on the most important things you need or want, rather than unnecessary extras. The 6100 is closer matched to the FlexCare, but cheaper still. 3. Where’s the best place to buy the Sonicare FlexCare? There are a number of retailers both online and offline that stock Sonicare electric toothbrushes, but those that stock this specific dual handle box option is a little more limited. Amazon and eBay have the best availability at the time of review. You might think that there is 1 model of the FlexCare, but sadly not. The name ‘FlexCare’ is used to describe a particular tier of brushes within Sonicares larger range of electric toothbrush. But, to make matters more complicated, rather than just launching the FlexCare A, FlexCare B and FlexCare C, one of the models within the FlexCare range is called nothing more than ‘FlexCare’. With this in mind, the following lists out the current models/variants within FlexCare range, highlighting their key differences. It is the standard ‘FlexCare’ not the + (Plus) or Platinum Connected that I am reviewing here. If you are interested in either of those models, we have reviewed the FlexCare+ here and we’ve reviewed the FlexCare Platinum Connected here. One last thing, just before I jump into the full review. The FlexCare range has been around for a few years and during that time the brushes have been updated. At the time of writing, the current versions are the dual handle packages HX6974/76 (Black) and HX6964/77 (White) but there have been other versions, notably the HX6962/73 and HX6971/33 that came with a UV sanitizer in the box, which have now been superseded. In this review you are getting my thoughts and opinions on the Sonicare FlexCare dual handle packages HX6974/76 (Black) and HX6964/77 (White). To clear up any confusion, here is the Amazon link for the product being reviewed. The FlexCare range might be a little confusing, but the package on offer here is pretty compelling all things considered. It might offer a little more than what most ‘need’ of an electric toothbrush, but, the FlexCare feels like a nice blend of value with the addition of more premium features. If you were to buy 2 of them, you would pay virtually the same price as this FlexCare dual handle pack that are better than the 3 Series. If you are looking for a his and hers toothbrush or want to equip the family, you are getting 2 premium brushes in 1 box for what really is the same price as 2 fairly average brushes. Earlier in this review I outlined the confusing range, but of this current FlexCare model, there are at the time of writing, 2 variants. The only difference between these is the color of the brush handle and provided accessories. The choice is between Black or White. The meaning box contents and features are the same. Here are what I consider to be the pros and cons of the Sonicare FlexCare Whitening Edition. Dual handle package – Includes 2 brush handles. Box contents – Contains 2 of everything, not just 2 brush handles. 2 charging stands and travel cases. Value – Great value offering considering the brush features and box contents. 4 cleaning modes – Going over and above what most need with different cleaning modes. Timer – A built in timer encourages you to brush for the dentist recommended 2 minutes along with a pacer to ensure an even brushing around the mouth. Battery life – Solid 3 weeks of battery life. Travel case – Premium travel case with USB cable attached for in case charging. Design – Compared to the rest of the Sonicare range it feels a little dated. Sonicare have a reputation of making good quality products and the FlexCare is no exception. However, I will start with a slight criticism and really this is my only complaint. The FlexCare looks a little dated in comparison to the other models. Cheaper models like the Sonicare 2 Series come in fun colors. The more premium DIamondClean and the DiamondClean Smart have a premium look and feel to them. Whilst the FlexCare is not ugly, compared to the other models, I am not so wowed by the look, particularly the White color option. However, this is a personal opinion. I am being a bit picky and the job of an electric toothbrush is about cleaning the teeth. With a fairly conventional in hand look and feel, the main body is a rounded/cylinder design that sits upright. At the top of the brush handle, is the detachable brush head, more on those shortly. With the brush head off the handle, you will see a small piece of metal poking out from the top, this is the shaft from the motor inside the brush handle. On the back of the brush handle are a series of ridges that offerup gripping points for the fingers when in hand. The look differs slightly, depending on what color option you go for when buying the brush. You have the choice of Black or White. With the Black colored brush handle, the back of the brush is Black too. Buy the White option and a pale/baby Blue color is present on the back of the handle. A nice touch is that the brush heads are color matched too. Not like the Oral-B Genius 8000 where you get a White brush head with a Black colored brush handle. On the front of the brush handle is the Sonicare logo. Below this is then a panel, which is a dark Grey color on the Black handled brush and more Silver on the White colored handle. Inside the panel is the power button at the top, with a cleaning mode button below it. Below that are the names of the 4 different cleaning modes available on the brush, stacked on top of each other. Then at the bottom of the panel is the battery status icon. On the base of the brush is a recess into which the charging pin on the provided charging stand fits. Do remember this is a dual handle package, so you get 2 brush handles in the box. You do to get 2 x charging stands, 2 x travel cases, 2 x USB wall adapters and 2 of each brush head. Despite my earlier criticism of the design, the accessories are color matched to the brush handle, which shows a level of attention and detail that I really like. Technically each brush handle is the the same. With the design covered, let me explain what else the brush offers. Sealed inside the brush handle is the battery, brush motor and the other electrical wizardry that makes this brush work. It is a Lithium-Ion (Li-Ion) battery that can last up to 3 weeks between charges based on 1 user brushing their teeth twice a day for 2 minutes. Check out the ‘battery life’ section of the review for more detail. The motor inside offers a maximum of 62,000 movements per minute to give your teeth a superb clean, and that it does. There are 4 different cleaning modes available on the brush. The different cleaning modes last for differing amounts of time and deliver different frequencies and brush strokes to the teeth to deliver a different clean. Here is a bit more detail on each of the 4 cleaning modes. We cover them more thoroughly in our post Sonicare Brushing Modes Explained. Clean – The ultimate in plaque removal (Standard mode). Lasts for 2 minutes. White – Whitening mode of 2 minutes to remove surface stains, plus an additional 30 seconds to brighten and polish your front teeth. Lasts for 2 minutes and 30 seconds. Gum care – Complete mode combines Clean mode with an additional minute to gently stimulate and massage your gums to improve gum health. Lasts for 3 minutes. The different cleaning modes allow you to select a mode that is most suitable for your oral healthcare goals. Those suffering with sore and tender gums as a result of gum disease, might find the gum care or sensitive cleaning modes most suitable, whilst using the AdaptiveClean brush head. For those wanting to ensure their teeth are as White as they can be, then the White mode with the DiamondClean brush head is the answer. To access the cleaning modes, you use the lower of the 2 buttons on the brush handle. Press it to cycle through the cleaning modes. The names of the modes on the brush handle will light up as the mode is selected. You then power the brush on, once the mode you want has been selected. The brush will remember the cleaning mode you have selected and will default into that mode next time you use the brush, unless you change it. The clean offered by this brush is excellent. At no time did I feel that the clean was bad. Personally, I prefer the clean offered by Oral-B brushes, it is not quite as soft as Sonicare and the small round brush heads are easier to get to the back teeth. Studies have shown both to be very effective though, particularly if you are moving from a manual brush. The FlexCare will give significant improvements to your oral health, removing more plaque and bacteria and making your teeth and gums healthier. Provided in the box are 2 different styles of brush head, but you get 2 of each. 1 for each brush handle. The interchangeable design of the brush heads are great. They just pull off and slide onto the brush handle.You can change them as frequently as you like. However, any brush head should be replaced after 3 months of use. Sooner if the bristles are worn of the reminder bristles have faded. Not familiar with reminder bristles? They are Blue colored bristles within the brush head, which over a typical 3 month period will fade from a relatively strong Blue to White color. If they turn White, replace the head. Each is specifically designed to deliver slightly different results. For example, the DiamondClean brush head is best for the White mode to help buff those teeth up, whilst the AdaptiveClean and InterClean are slightly more geared towards a more general clean of the teeth and gums. The AdaptiveClean is perhaps the best for new users, able to remove up to 10 times more plaque than a manual brush. The different styles of heads can be purchased separately in different pack sizes and different colors to match in with your brush. So, with multiple cleaning modes and different brush heads available, a couple of which are provided, the FlexCare is setup to help you achieve fantastic oral healthcare. This brush does not have Bluetooth connectivity nor is not smart like some other brushes are. If you want a brush with Bluetooth, take a look at the Sonicare FlexCare Platinum Connected or the DiamondClean Smart. Many Oral-B brushes offer this too, the Pro 3000 being one of the cheaper options. The innovation of the smart brushes are very clever and can help you improve your oral health, but one of the best ways to do so it to ensure you are using the right technique. What is perhaps misunderstood by many, is that using an electric toothbrush requires a different technique to cleaning the teeth compared to a manual one. The Sonicare instruction book included in the box does explain this pretty well. Therefore, if you decide the FlexCare is for you, be sure to consult the manual and learn the right way to brush. This is as important as the brush itself. In line with this, dentists recommend brushing twice a day for 2 minutes each time. If you are not, do so, it’s another of the biggest changes you can make to improve plaque removal and the health of your teeth and gums. Should the FlexCare be the first electric toothbrush you invest in, then it has some nifty features to help you. ‘Easy-start’ helps ease you into using an electric toothbrush. It gradually increases the sonic power over the first 14 brushing sessions. It can be deactivated if you don’t want to use it, but it is a gentle way to experience an electric toothbrush and not be put off by the additional power the brush delivers. I said how dentists advise 2 minutes of cleaning. Well despite 2 minutes being a relatively short period of time, few do clean for that long. To help you encourage you to do so, Sonicare have built into the handle a timer and quadpacer. From the moment the brush is powered on it begins timing. The quadpacer is an interval timer that beeps and briefly pauses the motor, normally at 30 second intervals to remind you to brush the 4 sections of your mouth evenly. There are 4 quadrants to the mouth. They are, top right, top left, bottom right and bottom left. If each are given 30 seconds attention, it results in the brush at 2 minutes, automatically turning itself off and your mouth hopefully feeling fresh and clean. The automatic power off feature conserves battery life and acts as a very clear signal you have reached the correct amount of brushing time. For the longer cleaning modes, the pacing is extended to continue the even clean. Whilst not essential, the addition of a pressure sensor would be welcomed. A pressure sensor is not that common on Sonicare brushes, but is on Oral-B handles. As the name implies, a sensor detects if too much pressure is applied during cleaning. As a consequence a light is illuminated to alert you. You can then reduce this so as not to do damage to the teeth. You soon learn, but the inclusion of such would help new users I think, particularly as excessive pressure is a common cause of gum recession. To be fair, the brush will make a straining sound if too much pressure is being used, but you need to listen out for that. With 21 days of battery life, this slim profiled brush handle is really quite impressive, but when you do need to charge it you get 2 charging solutions. The first is the standard desktop charging stand. Of plastic construction, it allows the brush handle to sit on top of it. The prong on the top of the stand fits into the base of the brush handle. Providing the hardwired power cable is connected to the socket, then the brush will charge. The cable is about 3.2 feet long and has a US plug on it. The stand itself supports 110-220v, meaning if you travel you likely only need a plug adapter, not a voltage adapter. However, a neat touch here is that the FlexCare comes with a travel case that allows the brush to be charged whilst inside. In the box are 2 charging stands and 2 travel cases. The travel case is a premium looking case that holds the handle and up to 2 brush heads. Color matched to the brush, also in the box is a USB to miniUSB cable and a US 2 pin USB wall adapter. The USB to miniUSB cable is detachable and can be connected between the case and any USB socket for charging the brush inside. The 2 pin wall adapter allows you to charge the brush from the mains power supply if you prefer. This is a fantastic solution for travelling. USB is an international standard and no matter where you are, you are likely to be able to recharge the brush with ease. The brush itself is water resistant, but not waterproof. This means if you rinse it under the tap and it gets wet, don’t worry too much. However, the brush is not designed to be used in or under water, so avoid using in the shower or bath. A rinse and a damp cloth is fine for cleaning. For that added extra peace of mind, the brush comes with a 2 year warranty that covers mechanical faults like the battery no longer charging or the power button not working. It does not cover user damage. All things considered, there is a LOT going for this brush. Sonicare have a reputation for good battery life in their brushes and they often outpace the competition. The FlexCare is no exception. Built into the brush handle is a Lithium-Ion (Li-Ion) battery that provides up to 3 weeks or 21 days brushing time between charges. 84 minutes of usage time, this is based on 1 user brushing twice a day for 2 minutes each time. This battery is sealed inside the handle and is not user removable. When the brush needs charging there are 2 different options. One option is the standard charging stand that the brush sits on. Color matched to the brush handle, the stand supports 110-220V and has a 2 pin US plug wired into it. The power cable length is about 3.2 feet in length. It can take up to 24 hours to charge fully. Should you want to leave the brush on the charging stand, this is fine. The other option is the travel case. This is great for those that travel frequently as you don’t need to take the charging stand. In fact, if you are travelling for less than 3 weeks you need not even charge it in the case. On one end of the case is a miniUSB connector. Attach the supplied USB to miniUSB cable to this and the brush can be charged in the case from a USB port on a socket or from a computer. In the box too is a power adapter with USB port which you could use to connect to a standard socket if you want. It is a shame that the case uses an older MiniUSB rather than MircoUSB or even USB Type C. That way you could share the charger for many smartphones with the case too, meaning one less cable to take with you. The battery icon on the front of the brush handle is broken into 3 sections. This gives an extra level of detail on the battery power. 3 Green LED’s mean you have 75-100% battery power. 2 Green LED’s mean you have 50-74% battery power. 1 Green LED means you have 25-49% battery power. 1 flashing Yellow LED means you have less than 25% remaining. If the battery charge of the Sonicare is low, you hear 3 beeps and 1 LED on the battery level indicator flashes yellow for 30 seconds after the 2-minute brushing cycle. When on the charger the flashing light of the battery gauge indicates that the toothbrush is charging. 1 solid Green LED indicates that the toothbrush is 34-66% charged. 2 solid Green LEDs indicate that the toothbrush is 67-94% charged and 3 solid Green LEDs indicate that the toothbrush is fully charged. When you hear 3 beeps and 1 of the 3 battery indicator LEDs is flashing Yellow, this will mean the power is too low and needs to be recharged. Ignoring the fact that this package contains 2 brush handles and all the accessories, I would expect this handle on its own to fetch around a minimum of $100-120 on average. Quite often, Sonicare brushes are then priced a little higher than what I think they are actually worth. Therefore a price tag of $150 would not surprise me. Shop around a little and you can get this dual handle option for as little as $150 for the pair (correct at time of writing). That makes them $75 per handle! Given what the handle offers, this is fantastic. The Sonicare 3 Series sells for this price and it has a fraction of the features and box contents. Ok, the slight catch is that you have to buy a package that includes 2 handles. But if you and your partner both want a new electric toothbrush, or a friend, a family member then you are getting an absolute steal in my opinion. In fact, I think even at $200 the dual handle package is a very good price. This brush like every other requires replacement brush heads for each user, every 3 months. Replacement heads can be purchased in packs of differing sizes. Normally, the price per brush head gets lower the more you buy. As a guide the cost per head is around $8. Given that most electric toothbrushes have a working life of 3-5 years (hopefully longer) we like to work out the cost of ownership over a 3 year period. Now being a dual handle pack, I will work the cost out for just 1 handle and I am going to be a little cautious and suggest each handle is worth $100, rather than the $75 that it is price as I write this review. Therefore, using the average cost (based on one user) over 3 years, the Flexcare will cost $188 or $0.17 per day to own. Ultimately the brush is only worth what you are prepared to pay for it, but I can tell you from my experience you are getting a fair bit of brush here. Sonicare are a trusted brand worldwide. Their products tend to be at the premium end of the scale with quality and reliability you can depend upon. We receive few complaints about Sonicare models. The standard warranty or guarantee if you prefer, runs for 2 years/24 months from the date of purchase. During my testing I have looked for possible weaknesses, but found nothing of concern. I don’t advocate buying a product you don’t need. Nor would I suggest spending more than you need to. The ProtectiveClean 4100 and 6100 are great examples of cheaper, but perfectly capable brushes. Spend a little more and you get premium features. The FlexCare offers the premium features; multiple cleaning modes, built in timer, 3 week battery life, premium travel cases and of course a fantastic clean. But, at the time of review, the value delivered here is exceptional. This is a dual handle package, but price it per handle and you can get all these great extras for essentially the same price as a more basic toothbrush. If you need 2 electric toothbrushes and the cost of this is under $200, just go buy it. You will not be disappointed. Is the Sonicare FlexCare an oscillating brush? No. It is a Sonic action brush. How many brushing modes does the FlexCare have? This brush offers 4 different cleaning modes. They are Clean, White, Sensitive and Gum Care. The FlexCare comes with 2 x AdaptiveClean and 2 x DiamondClean brush heads. Sonicare do have a range of alternative brush heads that are compatible including, ProResults, ProResults Gum Health, Sensitive and Sensitive that can be purchased as alternatives to those included in the box. Does the Sonicare FlexCare have a pressure sensor? Does the Sonicare FlexCare have Bluetooth? Does the Sonicare FlexCare come with a warranty & how long is it? Does the FlexCare have a built in timer? The battery lasts up to 84 minutes, which is equivalent to 3 weeks or 21 days of usage based on 2 x 2 minute cleans per day. Yes, a charging station is included with the toothbrush along with a travel case which can also charge the brush. A charging stand and travel case is provided for both brush handles. Can I use the Sonicare FlexCare in the shower? No, the manual specifically states not to use the DiamondClean in the shower or bath. However, the handles are resistant to water, so they can be rinsed under a tap. Yes. The FlexCare comes with 2 travel cases, 1 for each brush handle. The hard travel case holds the brush and up to 2 brush heads and allows for the brush to be charged in the case too. 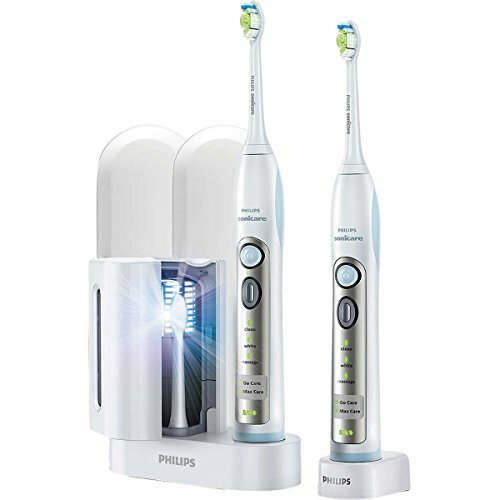 Do you own or have you used the Philips Sonicare FlexCare?